The coastal express heads North all the time. 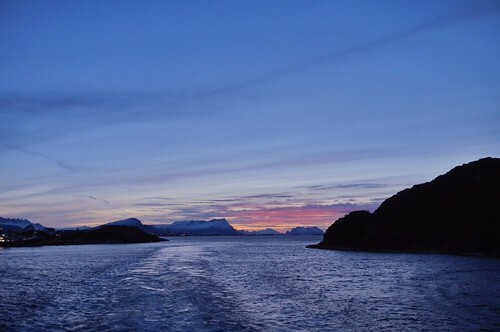 Today photos from our departure from Bodø - the central town in Nordland County. It is 3pm in the afternoon and the sun is already setting. 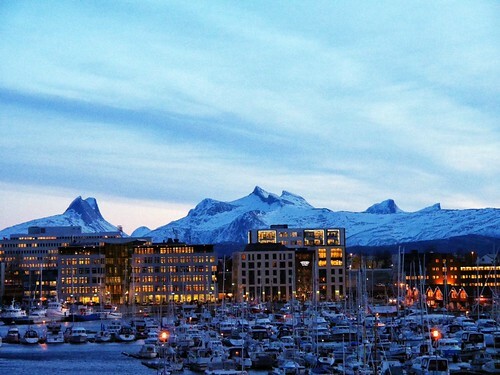 Bodø is the largest city and administrative centre of Nordland county in Norway. Its population is above 45 000 people, which makes it the second largest city in Northern Norway, after Tromsø. The city is the largest within a 600 kilometre radius, making it an important centre of commerce and a hub for exploring the North of Norway. The town is known for its powerful winds, so it would be wise to bring a wind jacket.